ABC has renewed the hit comedy series The Middle for next season. The show is currently in its eighth season on the network. Since its debut in 2009 when it helped launch ABC's hit Wednesday night comedy block, The Middle has been a strong performer and a dependable anchor in the 8 o'clock hour. In its move this season from Wednesday to Tuesday night in the 8:00 p.m. anchor position, The Middle launched yet another successful comedy block, with ABC claiming Tuesday's top comedies this season. Improving its half-hour by 22% year to year with Total Viewers, The Middle is ABC's most watched comedy in the Tuesday time period in 5 years - since 2011-12 with the debut season of Last Man Standing. Two-time Emmy-winner Patricia Heaton stars in this warm and witty single-camera comedy about raising a family and lowering your expectations. Middle-aged, middle class and living in the middle of the country in Orson, Indiana, Frankie Heck is a harried wife and mother of three who uses her wry wit and sense of humor to get her family through each day intact. Frankie works as a dental assistant, and her unflappable husband, Mike, is manager at the local quarry and her sardonic partner in the daily grind that is raising their average - yes, most definitely average - family. 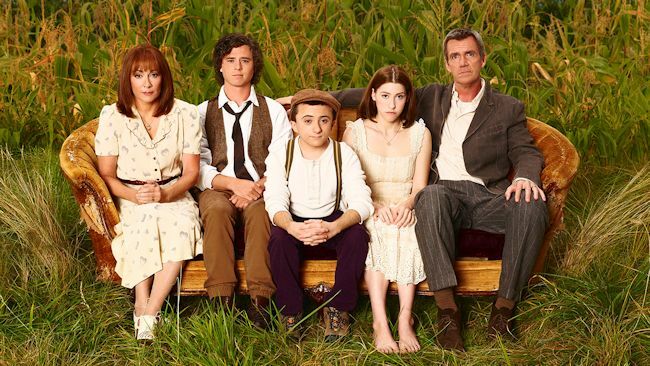 The Middle stars Patricia Heaton as Frankie, Neil Flynn as Mike, Charlie McDermott as Axl, Eden Sher as Sue and Atticus Shaffer as Brick. For the week of Jan. 30-Feb. 3, 2017, we have many current sitcom stars and past sitcom stars on TV talk shows! All times listed are Eastern. So get your DVRs (or whatever you use) ready! Ready? Here is all what you need to know for the coming week! Vanessa Hudgens (Powerless) - Watch Vanessa on The Tonight Show Starring Jimmy Fallon at 11:34pm on NBC. She will also be on NBC's Today sometime between 7-9am and in the 9am hour. She can be heard on The Morning Mash Up on SiriusXM at 11:20am. Morris Chestnut (Out All Night) - Morris drops by Jimmy Kimmel Live! at 11:35pm on ABC. Drew Carey (The Drew Carey Show/The Good Life) - Drew appears on The Late Late Show with James Corden at 12:37am on CBS. Keke Palmer (Scream Queens/True Jackson, VP) - Keke is a guest on The Late Late Show with James Corden at 12:37am on CBS. Bill Burr (F Is for Family) - Bill visits Conan at 11pm on TBS. Arden Myrin (Working) - Arden is a guest on @midnight on Comedy Central at midnight. Timothy Olyphant (Santa Clarita Diet) - Timothy appears on The Ellen DeGeneres Show, so check your local listings. Mario Lopez (Saved by the Bell/Saved by the Bell: The College Years) - Mario stops by The Ellen DeGeneres Show, so check your local listings. Adam Scott (Parks and Recreation) - Catch Adam on Jimmy Kimmel Live! at 11:35pm on ABC. Dakota Johnson (Ben and Kate) - Dakota stops by The Tonight Show Starring Jimmy Fallon at 11:34pm on NBC. Colin Hanks (Life in Pieces) - Colin appears on The Tonight Show Starring Jimmy Fallon at 11:34pm on NBC. He talks about the documentary Eagles of Death Metal: Nos Amis (Our Friends) on LIVE! with Kelly (check your listings) and on the AOL Build Show at 3pm. Lauren Ash (Superstore) - Lauren is a guest on Late Night with Seth Meyers at 12:36am on NBC. She will also be on the AOL Build Show at 1pm. Johnny Galecki (The Big Bang Theory/Roseanne) - Johnny visits The Late Late Show with James Corden at 12:37am on CBS. Timothy Olyphant (Santa Clarita Diet) - Timothy is a guest on Conan at 11pm on TBS. Keke Palmer (Scream Queens/True Jackson, VP) - Keke chats with the ladies of The View on ABC at 11am ET/10am CT-PT. She also talks about Scream Queens on NBC's Today in the 9am hour. Finally, she will be on Steve Harvey, so check your local listings. Cristela Alonzo (Cristela) - Cristela is a guest on Harry, so check your local listings. Lea Thompson (Caroline in the City) - Lea discusses season 5 of her Freeform TV show Switched at Birth on People Now at 8:30am. Marcia Gay Harden (Trophy Wife) - Marcia talks about Fifty Shades Darker on NBC's Today sometime between 7-9am and and in the 10am hour, on New York Live on WNBC in New York at 11:30am ET and on the AOL Build Show at 2pm. Stephen Dorff (What a Dummy) - Stephen is a guest on The Talk on CBS at 2pm ET/1pm CT-PT. Peter Engel (Producer of Saved by the Bell/California Dreams/Hang Time/City Guys) - Peter will be on PIX11 Morning News on WPIX in New York at 8:50am. Dakota Johnson (Ben and Kate) - Dakota is a guest on Late Night with Seth Meyers at 12:36am on NBC. She also talks about Fifty Shades Darker on NBC's Today sometime between 7-9am. Jermaine Fowler (Superior Donuts) - Jermaine visits The Late Late Show with James Corden at 12:37am on CBS. David Koechner (Superior Donuts/The Office/Hank) and Maz Jobrani (Superior Donuts/The Knights of Prosperity) - David and Maz are guests on @midnight on Comedy Central at midnight. Blake Anderson (Workaholics) - Blake visits Conan at 11pm on TBS. Keke Palmer (Scream Queens/True Jackson, VP) - Keke is a guest on Watch What Happens: Live at 11pm on Bravo. She will also be on The Wendy Williams Show at 2am on BET or on your local stations and on the AOL Build Show at 12pm. Johnny Galecki (The Big Bang Theory/Roseanne) - Johnny chats with the ladies of The View on ABC at 11am ET/10am CT-PT. Carla Gugino (Spin City) - Carla talks about The Space Between Us on NBC's Today in the 10am hour and on LIVE! with Kelly, so check your listings. Patrick Warburton (Crowded/Rules of Engagement/Seinfeld) - Patrick stops by Rachael Ray, so check your local listings. Stephen Dorff (What a Dummy) - Stephen talks about his new movie Wheeler on the AOL Build Show at 5pm and on New York Live on WNBC in New York at 11:30am ET. James Brolin (Life in Pieces) - James is a guest on The Talk on CBS at 2pm ET/1pm CT-PT. Rob Huebel (Wet Hot American Summer: First Day of Camp/Transparent) - Rob appears on @midnight on Comedy Central at midnight. Will Sasso (Less Than Perfect) - Will is a guest on @midnight on Comedy Central at midnight. Ken Jeong (Dr. Ken/Community) - Ken visits Conan at 11pm on TBS. He will also be on The Real, so check your local listings. Colin Hanks (Life in Pieces) - Colin drops by Conan at 11pm on TBS. Andrew Rannells (Girls/The New Normal) - Andrew stops by Watch What Happens: Live at 11pm on Bravo. Suzy Nakamura (Dr. Ken/Go On/Help Me Help You) - Suzy is a guest on The Real, so check your local listings. Drew Barrymore (Santa Clarita Diet) - Drew appears on The Ellen DeGeneres Show, so check your local listings. Thomas Sadoski (Life in Pieces) - Thomas talks about Life in Pieces on the AOL Build Show at 1pm and on New York Live on WNBC in New York at 11:30am ET. Giovanni Ribisi (Dads/My Two Dads) - Giovanni talks about Sneaky Pete on the AOL Build Show at 3:30pm. Marcia Gay Harden (Trophy Wife) and Thomas Lennon (The Odd Couple/Sean Saves the World/Reno 911!) - Marcia and Thomas guest co-host The Talk on CBS at 2pm ET/1pm CT-PT. Thomas Sadoski (Life in Pieces) - Watch Thomas on The Late Show with Stephen Colbert at 11:35pm on CBS. Retta (Parks and Recreation) - Retta appears on Late Night with Seth Meyers at 12:36am on NBC. Jason Biggs (Mad Love/Drexell's Class) - Jason guest co-hosts on Guy Day Friday on The View on ABC at 11am ET/10am CT-PT. Edie Falco (Nurse Jackie) - Edie talks about the film The Comedian on NBC's Today in the 10am hour and on LIVE! with Kelly, so check your listings. Jace Norman (Henry Danger) - Jace appears on Harry, so check your local listings. Keke Palmer (Scream Queens/True Jackson, VP) - KeKe opens up about writing her first book, I Don’t Belong to You, on People Now at 8:30am. Giovanni Ribisi (Dads/My Two Dads) and Margo Martindale (The Millers) - Giovanni appears on a repeat of The Late Late Show with James Corden at 12:37am on CBS. Giovanni chats about his new Netflix show Sneaky Pete on People Now at 8:30am. Giovanni and Margo will also be on NBC's Today in the 10am hour and on New York Live on WNBC in New York at 11:30am ET. Sherri Shepherd (Less Than Perfect/Sherri) - One of television’s funniest women gets serious. Behind the laughs, Sherri has been coping with a serious health issue and the stress of headlines about her divorce and court battles over a baby via surrogate and frozen embryos. Today, she finally sets the record straight on The Dr. Oz Show, so check your local listings. Drew Barrymore and Timothy Olyphant (The Santa Clarita Diet) - Drew and Timothy talk about The Santa Clarita Diet on NBC's Today in the 10am hour. Henry Winkler (Happy Days/Out of Practice/Arrested Development) - Henry talks about the next installment in the Here's Hank, series, Here's Hank: Always Watch Out for the Flying Potato Salad, on the AOL Build Show at 5pm. Clark Gregg (The New Adventures of Old Christine) - Clark is a guest on The Talk on CBS at 2pm ET/1pm CT-PT. Katy Mixon (American Housewife/Mike & Molly) - Katy appears on The Talk on CBS at 2pm ET/1pm CT-PT.